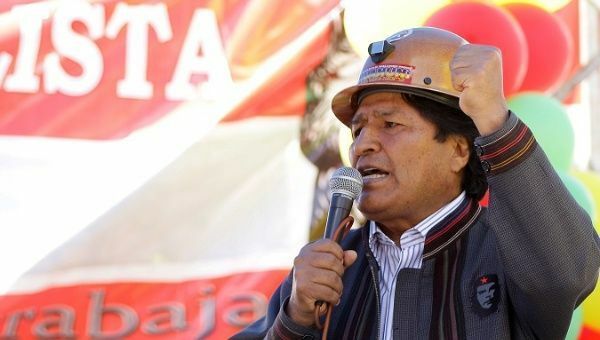 Bolivian President Evo Morales said Sunday that the United States and the Organization of American States are implementing a plan with the purpose of defeating the Bolivarian Revolution in Venezuela. “Before the elections they will carry out violent actions supported by the media and after the elections they will try a military invasion with Armed Forces from neighboring countries,” President Morales said on his official Twitter account. Earlier this week U.S. Vice President Mike Pence requested that the OAS suspend Venezuela in during a speech at the Permanent Council of the OAS, comments that were rejected by the Venezuelan government calling such statements an aggression to disturb the peace in the country and further explaining that Venezuela is already in the process of leaving the “colonial” group. The empire acts out of fear of the sovereign vote and knows that it will never again subject the free people. On May 20 Venezuelans will go to the polls to elect the nation’s president and members of the legislative councils, in the 24th election in 19 years of the Bolivarian Revolution. Despite boycott of some factions in the right, five candidates submitted their candidacy for the Presidency. According to latest polls, Nicolás Maduro, the candidate of the Frente Amplio de la Patria, a coalition of left-wing parties, remains the favorite to win.